You may or may not be aware that April marks the 400th anniversary of William Shakespeare, and in celebration of this I was asked by the lovely people at Viking to produce some art work around inspired by him using the supplies they sent us. Whilst not yet at a stage in life where I can directly introduce the kids to the works of William Shakespeare, they do thoroughly enjoy watching “Gnomeo and Juliette” and this has been on several times in our home the last couple of weeks to subtly get them appreciating his wonderful work (though I am not sure how he would feel about gnomes?!). 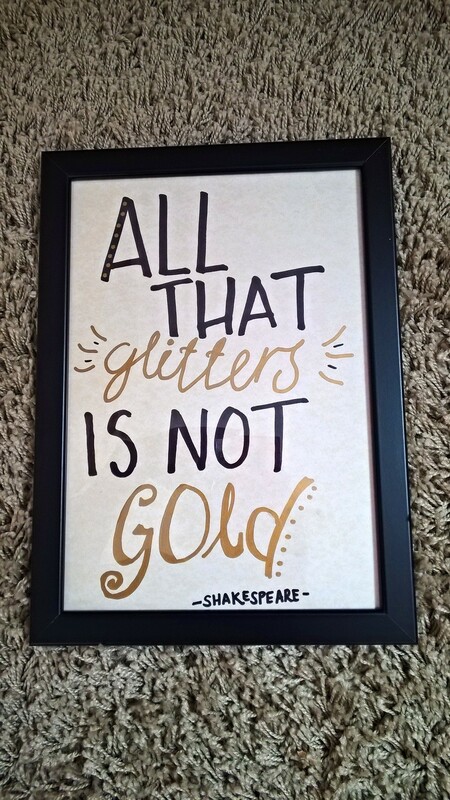 I loved Shakespeare at school and appreciate it more so as I have gotten older. I love that his plays can be enjoyed for entertainment and at face value or can be studied in depth to open up ones imagination and challenge the mind. 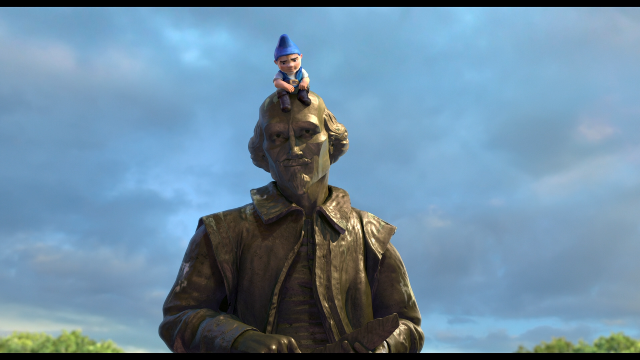 As a lover of theatre and one who adored drama and theatre studies at school, I just loved his work and the scope available for performance (perhaps that’s why I find “Gnomeo and Juliette” both entertaining and brilliant)! A dream certainly would be to go to see a play performed at the Globe Theatre as well as taking the kids to Stratford upon Avon, when they can appreciate and understand its history and significance. 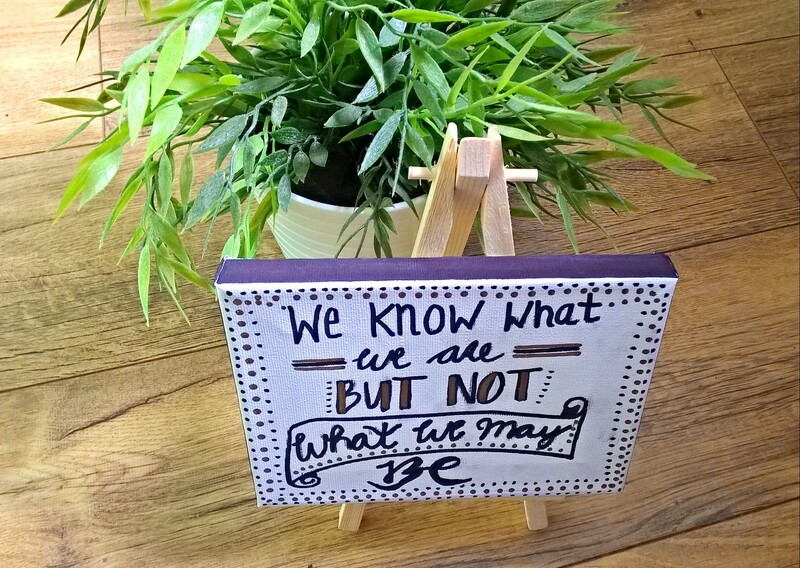 On a more low key and subtle Shakespearean level I have been really excited about this project as it gives me an opportunity to create some quotes for our home to inspire and get us thinking. For the challenge I did 2 pieces..one a canvas for the landing and one a “Print” for Megan’s room. The canvas is my main piece, the print a bonus as I got carried away. I really love black and white stuff in our home and so I didn’t want to make something that was OTT or not in keeping with our style. 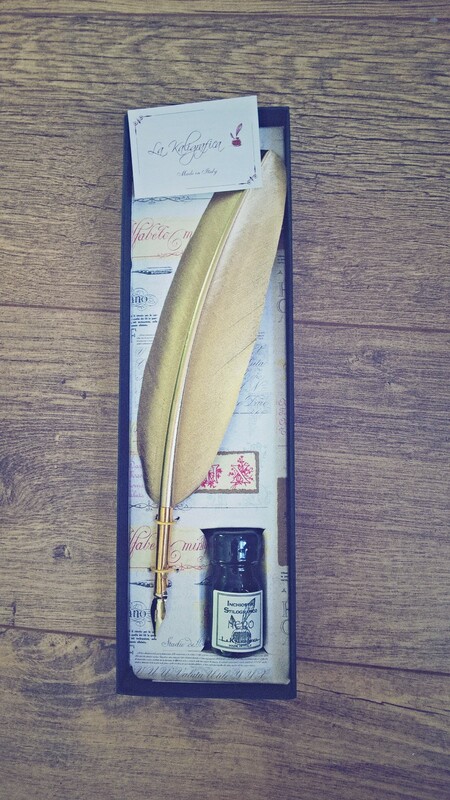 Whilst I loved the quill, I felt I may make too much mess without Practice and so opted for a more modern tool – The Sharpie! 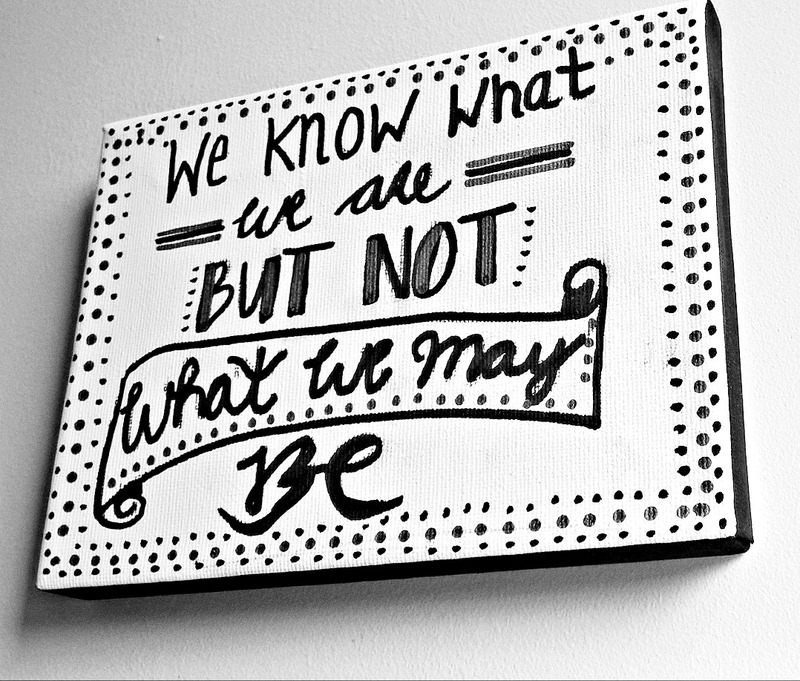 I chose a quote from Hamlet – “We Know what we are, But not what we may be“. I love it. I love that it gives perspective, gets the mind wondering on the possibilities that come with future and that it kind of sums up our beliefs that there is more to life than this…whatever we face here and now, will not be forever because we can have more, be more and enjoy more. Its a certainly a great reminder on hard days! 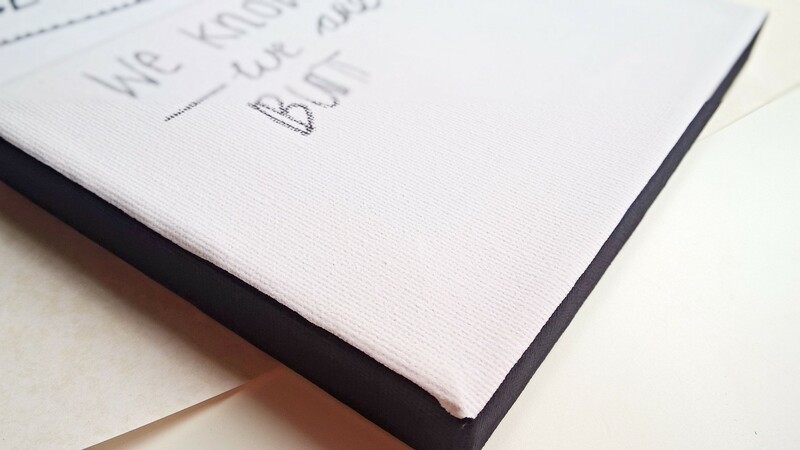 I used some of the paper to plan it out and then got to work; I used the chunky sharpie all around the outside edge to frame it and then used a mix of modern and curvy lettering in pencil to design it on the canvas. I decided to add a little scroll to tie the quote into its background, and then went over it all in the thinner sharpie. 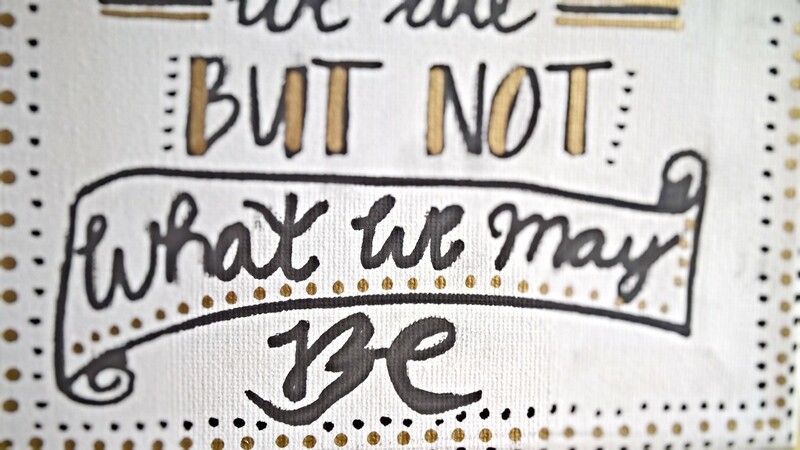 Next I added some of the gold paint pen to embellish it and voilà … a lovely quote for our landing! 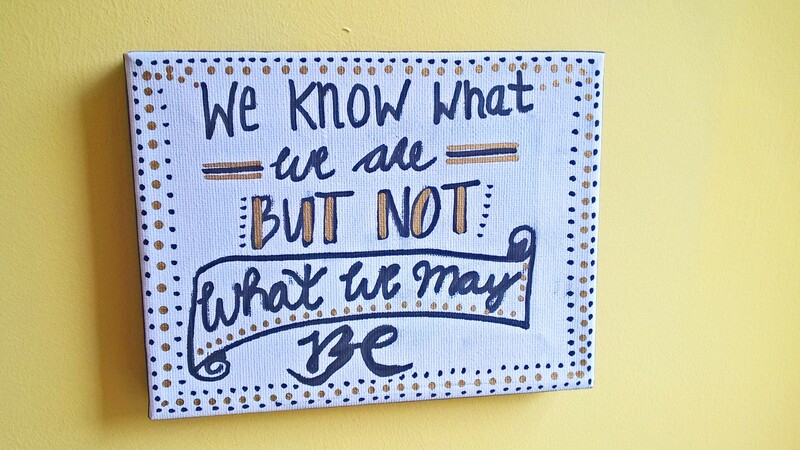 For the print in Megsie’s room I simply used a piece of champagne parchment paper and wrote the quote out with the chunky sharpie and gold metallic paint pen. I then popped it in a black frame and am loving its simplicity and how great it looks. These are the colours we hope to redecorate her room in and the ‘Merchant of Venice’ quote I felt is great for a little girls room and thought provoking as she grows up! I thoroughly enjoyed this project and it was great to get pondering on the works of man who has influenced so many personally, with our movies, theatre and now quotes in homes. He will continue to influence us and live in the hearts, minds and lives of many for a lot more years to come. 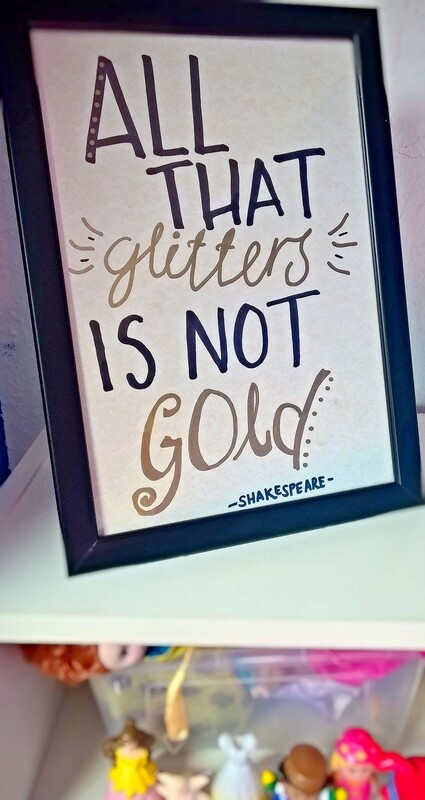 Happy Shakespeare Month! 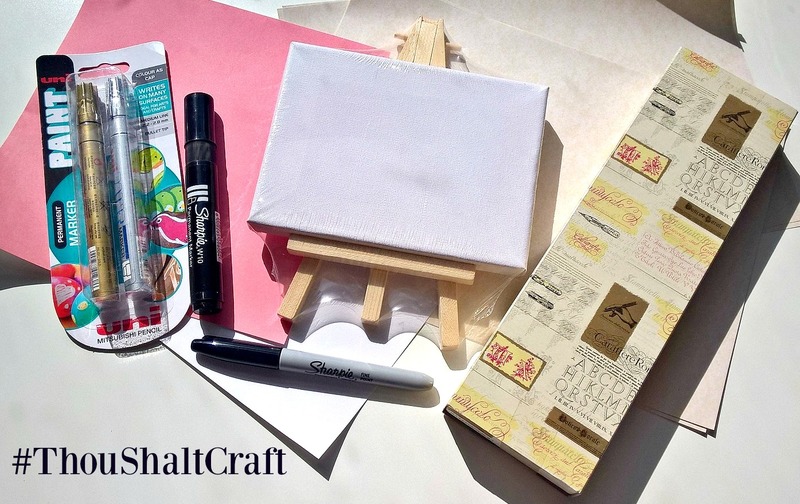 Disclaimer: The craft box was sent to us for free in return for a creative post! Thank you Viking! Next Post My Birth Options and No plan!